I REALLY really love doing giveaways! I feel like it’s my way of giving back to the Holistic Health Herbalist community…..cause I know I wouldn’t be doing all of this blogging and sharing great stuff without all of you guys! So welcome to my FIRST giveaway here at HHH! This mid-month I’m teaming up with some other real food bloggers to offer you a great gift! How does a $400 Amazon Gift Card sound??? 2. Leave a Comment about what you would buy if you won! 3. Use the Rafflecopter widget below to confirm these entries and unlock more! 4. For more ways to win, be sure to visit all of the blogs I’ve teamed up with for this giveaway! A winner will be chosen via random.org. We will announce the lucky winner on March 1st. The winner will have 48 hours to respond to an email with his/her full name, address, and phone number. There is no purchase necessary to win. This giveaway is open to everyone! I would purchase nutritious flours to bake with my gluten intolerance it is much easier to buy them online. And eco- cookware and storage. I would buy a new treadmill. I’m torn between a new blender, dehydrator, or new cookware. I would buy baby items for my baby due in may. I would get a new laptop, especially as mine has switched itself off twice today! I would buy some books that are on my Wish List (Dr Susan Blume – Immune System Recovery Plan, Dr. Alejandro Junger – The Clean Program), and a mini-trampoline. I’ve heard about all the wonderful benefits of rebounding and would love to get one! I would save it for when our oldest goes to college and what we couldn’t buy used we could order. I would use it on aromatherapy supplies and herbs! Oh boy- that’s a lotta Amazon cash! I would get some YaxTrax (this snow is brutal! ), some herb wildcrafting books, and some cooperative games for my son. I would get a kitchen gadget or some tools. I would buy diapers for my grandson. I would get some new snow boots for my little man this winter has been tough. Some rosemary gladstar books and a bunch of herbs and oils. I’d get a Vitamix or a grain mill for my Kitchen Aid. I have an auto-immune disease and I’m trying to use natural remedies to improve my health. My first purchase would be a “library” of essential oils, along with things like carrot seed and raspberry seed oils. I’d get a serger! And some EOs, of course. 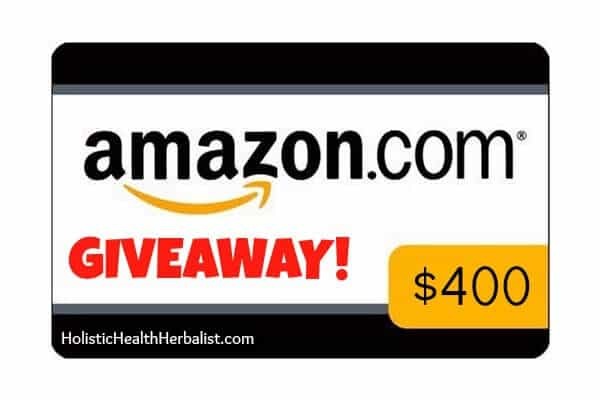 Oh the many herbs, carrier oils and essential oils I would buy with an Amazon GC… this is a wonderful giveaway!!! I would use finally get a natural medicine cabinet stocked! I’ve been dying to collect some basic essential oils and jars, etc. for storing some homemade concoctions. Probably stuff for my kids…I know,mama no brainer.